Irrespective of any turbulent political situations or events that might be taking place around the world, Lewis Smith, Director of Koopman Rare Art, reported that it was “business as usual” at TEFAF Maastricht 2019. “Koopman Rare Art has had a very positive TEFAF Maastricht 2019. Not only are we delighted with the number of sales achieved – at all levels – we have been encouraged by the interest shown in the superlative antique silver on display. “Attendance was strong, with buyers from Europe, the USA and a small percentage from Asia. Many regular customers made the journey to Maastricht and it is clear they remain passionate about antique silver, which bodes well for the future. 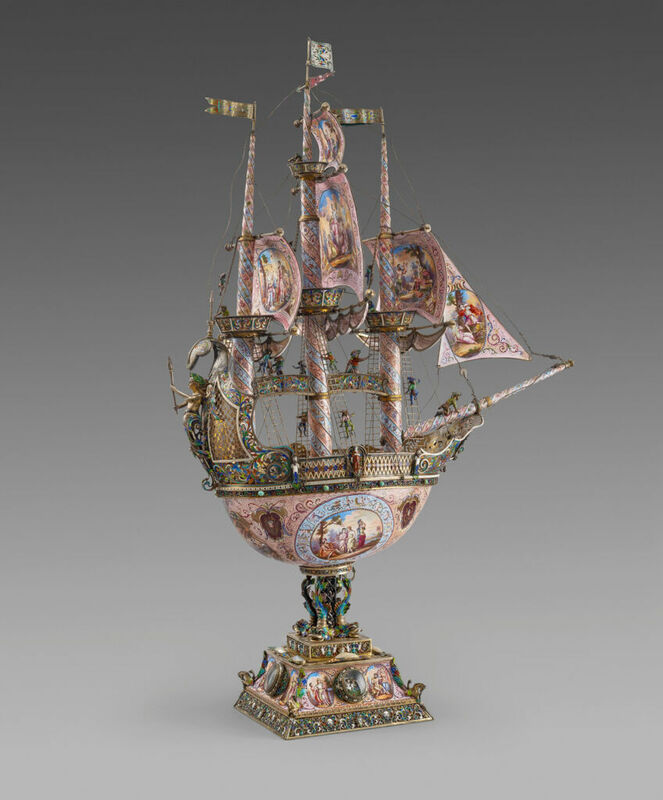 For example, an outstanding silver Nef embellished with opulent enamel and mother-of-pearl decoration by the prolific and inventive Austrian goldsmith, Hermann Böhm sailed off to a new home. Made in Vienna, in circa 1890 this elaborate work of art had an asking price in the region of €310,000. 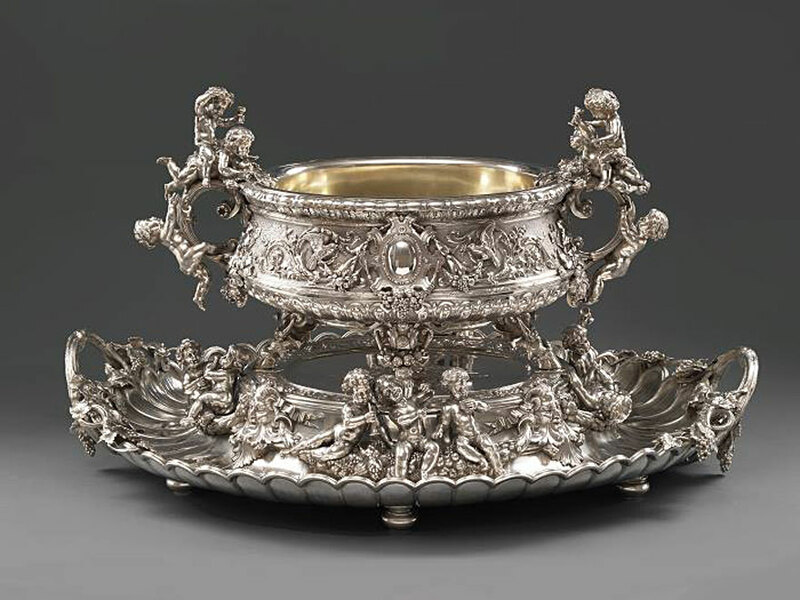 Similarly lavish and ostentatious, a remarkable silver gilt and rock crystal Cornucopia, by the same maker, was also snapped up (Asking price in the region of €120,000). Sales in this category included a distinguished set of eight silver-gilt George III wine coasters, made in London in 1817 and bearing the maker’s mark of William Burwash. The coasters were made for Charles-Talbot, 2nd Earl Talbot (1777-1849). They had an asking price of €140,500. In addition an elegant George III silver bread-basket, also dating from 1817 and made by Paul Storr was also sold. The basket is engraved with a coat-of-arms of Hugh, the 3rd Duke of Northumberland (asking price in the region of €135,000). Paul Storr was also the maker of a set of four striking candlesticks, dating from 1808, which sold early on with an asking price in the region of €205,000. Likewise, one lucky collector was quick to purchase a stunning pair of George II silver candelabra dating from 1751 made by Eliza Godfrey, one of the most noteworthy women goldsmiths of the 18th century. Decorated with particularly accomplished chasing of scrolls, foliage and rocaille ornament, the candelabra is typical of the exceptional quality and sophisticated style that Eliza Godfrey is renowned for. Bearing the crests of Crichton for William, 5th Earl of Dumfries, K.T. (d.1758) the pair had an asking price of €76,000. “Not surprisingly the spectacularly magnificent and impressive silver-gilt Shield of Achilles, with the Royal Arms of Ernst Augustus, Duke of Cumberland and King of Hanover (1771-1851), which takes pride of place on the stand, drew the crowds onto our stand on a daily basis. Koopman Rare Art will be exhibiting at Masterpiece London Art Fair 2019 from 27 June to 3 July.